2017-07-07 - Columbia/Adair Utilities District Office, 109 Grant Lane, Columbia, KY - Photo by Ed Waggener, ColumbiaMagazine.com(c). 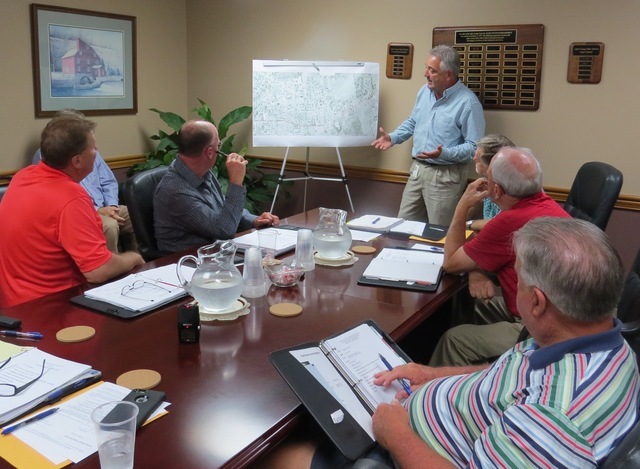 General Manager Lenny Stone outlines the scope of the Burkesville Street Waterline Project from a map provided by Monarch Engineering of Lawrenceburg, KY. A fundamental plan of the project is to have a new 8" line, approximately 5,000 feet long, on the east side of Burkesville Street. Because of the heavy rock and maze of crossovers, an existing 4" line will be retained on the west side of the road. The board approved proceding with the project at its special called meeting, Thursday, July 6, 2017. Seated, right side, front to back, are Commissioners Junior Brown, Doug Sapp, and Chair Wid Harris. On the left, are Commissioners Mike Newton and David Jones.